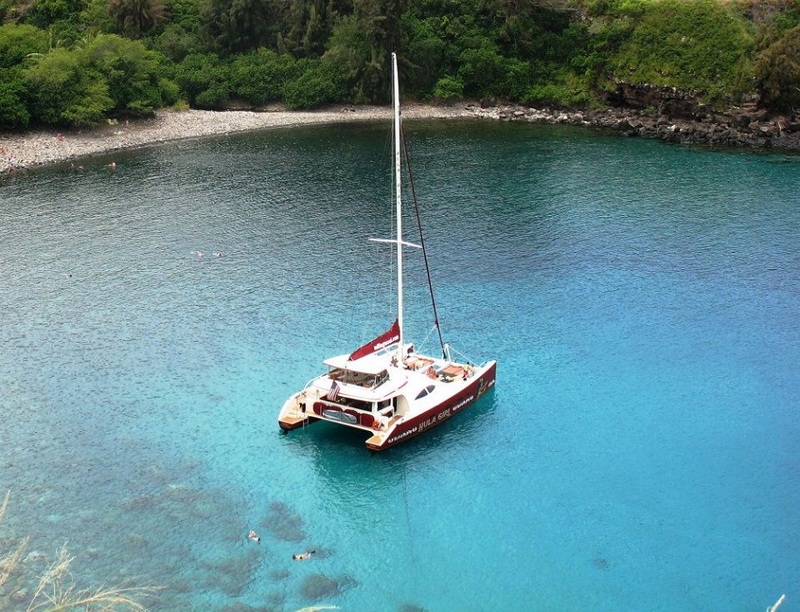 Join the Hula Girl for relaxing West Maui snorkeling excursion. Cruise along Maui's scenic coastline to premier snorkeling destinations such as Honolua Bay Marine Sanctuary. See the majestic Humpback whales up close from the large stable platform of the Hula Girl. On every sail between the months of December through April, you will enjoy spectacular whale watching. Our knowledgeable captains and crew are marine naturalists who are happy to share information on an informal basis throughout your sailing excursion. We requests no oils or spray bottle sunscreens are brought onboard. We are now offering for sale Reef Safe sunscreen, please help us to protect our marine environment. 9:15 AM is the check-in time, 9:30 AM is the departure time and the required per person electronic waiver is appreciated in advance of your charter.